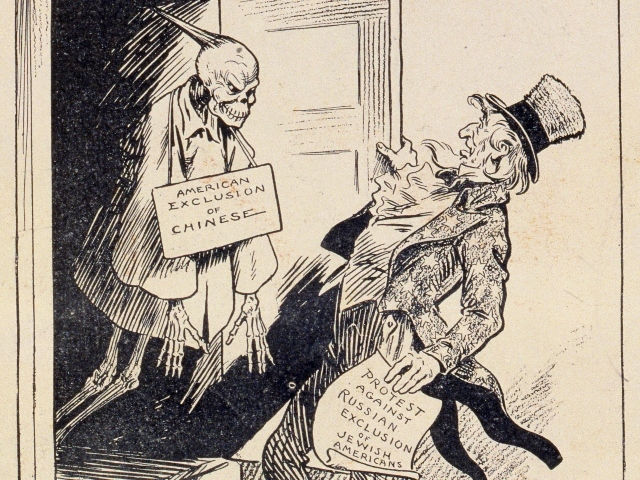 The spectre of Chinese exclusion comes to haunt Uncle Sam's "Protest Against Russian Exclusion of Jewish Americans." Louise Glackens, "A Skeleton in His Closet," Puck, vol. 70, no. 1818 (Jan 3, 1912), 2. Courtesy of the Library of Congress. 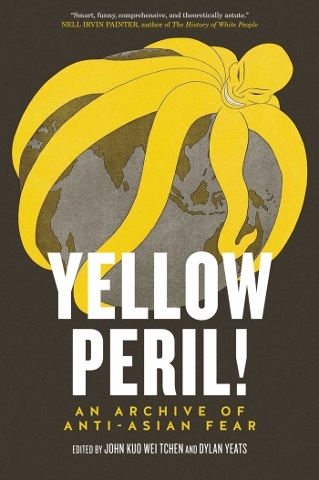 The concept of the “yellow peril” is centuries old, and although today it brings to mind racist fears of East Asia, some of its first uses refer to West and South Asia. As John Kuo Wei Tchen and Dylan Yeats lay out in their rich documentary survey of the persistence of anti-Asian paranoia in literature, art, pop culture, and everyday life, “yellow is part of a visual imaginary that varies in relation to the extension of European colonization into ‘the Orient. '” The object of blame—the “other”—is always shifting. In the 19th century, the concept took on a new life in the US with the expansion westward. The white protestant promise that pioneers would find new beginnings in the west turned out to be an empty one, and the Chinese in America, then working the railroads along the Pacific, became the ones to blame. Class conflict turned racial. Below is a gallery of images from the book and three short excerpts from Yellow Peril! that describe how yellow perilist scapegoating of immigrants in the US arose, a Chinese view of the Statue of Liberty, and the legacies of “yellow peril” in immigration law that are with us today. To read an interview with the authors of Yellow Peril!, check out “From Coolie to Googlebot” on CultureStrike. 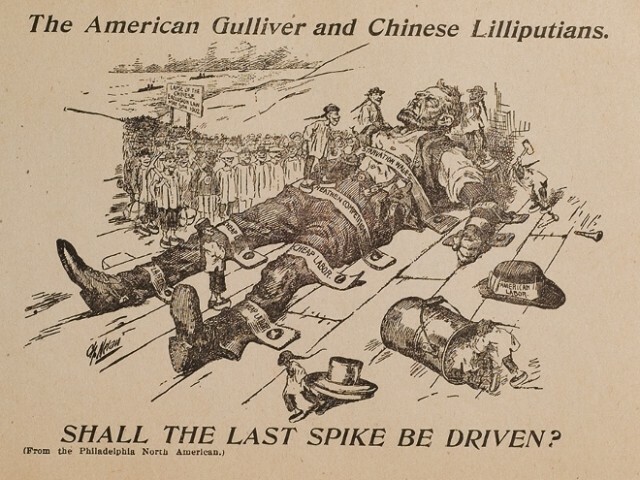 In this image from the American Federation of Labor in 1902, American labor travels like Gulliver to expand his possibilities only to be tied down by a horde of tiny men wielding railroad spikes and cheap labor. “The American Gulliver and Chinese Lilliputians." Fales Library and Special Collections, New York University. Kaiser Wilhelm II allegedly coined the term "yellow peril" after a dream he had in which a seated Buddha riding atop a dragon threatened to invade Europe. 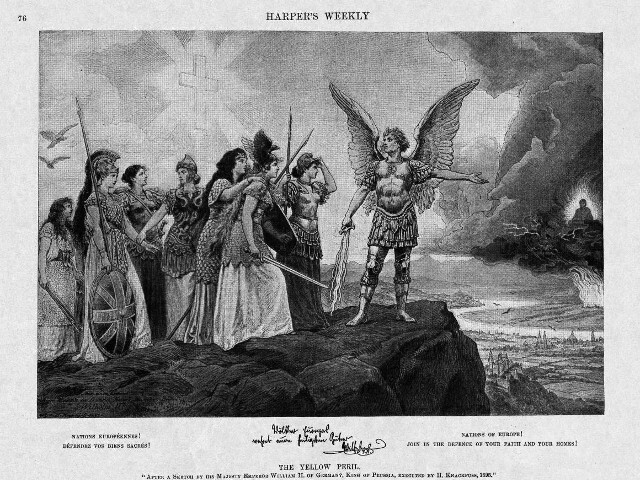 He commissioned Hermann Knackfuss to illustrate his dream, resulting in this painting, which appeared in Harper's Weekly in 1898. In the painting, Archangel Michael calls for unity in Christian Europe, with each nation represented by women warriors. In the distance, a seated Buddha on a dragon thunderstorm sweeps the landscape below. Harper's Weekly, vol. 42, no. 2144, January 22, 1989. Courtesy of the New York Public Library. 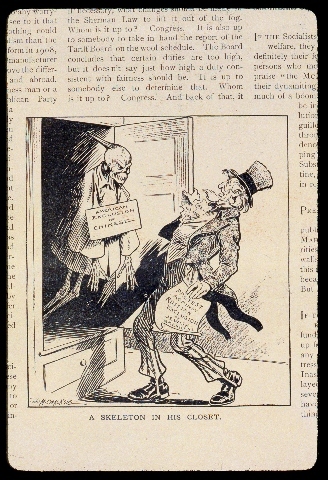 "The Great Fear of the Period—That Uncle Sam May Be Swallowed by Foreigners. The Problem Solved." This cartoon positions the viewer on the northern border of the continental United States, with the Atlantic Ocean to the left and the Pacific to the right, with the soon-to-be-completed transcontinental railroad in the background. 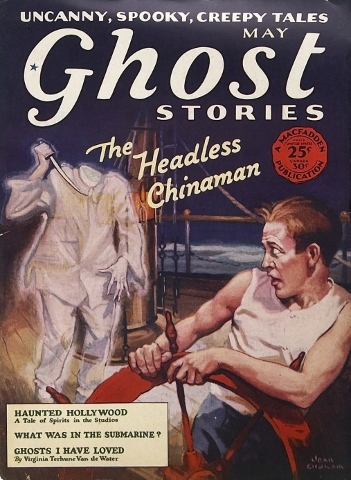 As the Irishman travels west and the Chinese man travels east, they first consume Uncle Sam—then the Chinese man consumes his Irish counterpart. (San Francisco: White & Bauer Lithographers, late 1860s). Courtesy of the Library of Congress. 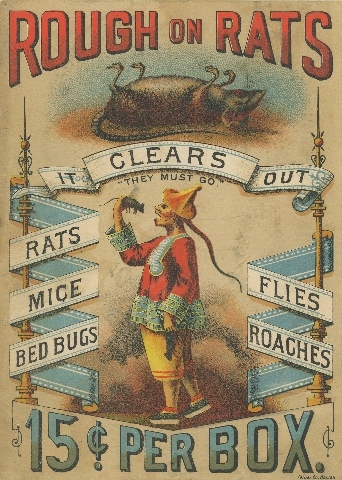 "Rough on Rats" (c. 1880s) advertises arsenic at fifteen cents a box to rid houses of "rats, mice, moths, ants, mosquitoes, bed bugs, insects, skunk, weasel, gophers, chipmunks, moles, musk rats, etc." Photo by Phillip Chen. Courtesy of the Lenore-Metrick Chen Collection. 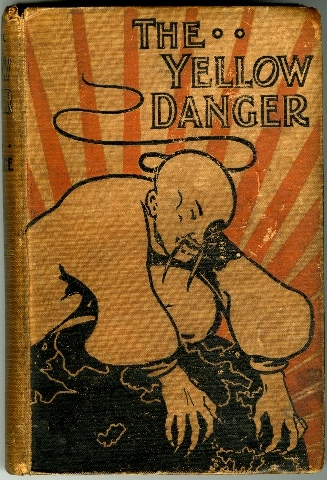 The Yellow Danger, M.P. Shiel (London: Grant Richards, 1898). Fales British Collection. Fales Library and Special Collections, New York University. 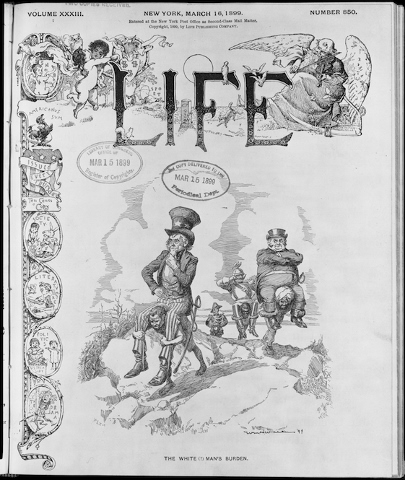 The cover of LIFE magazine: "The White (?) Man's Burden," William H. Walker. March 15, 1899. Courtesy of the Library of Congress. 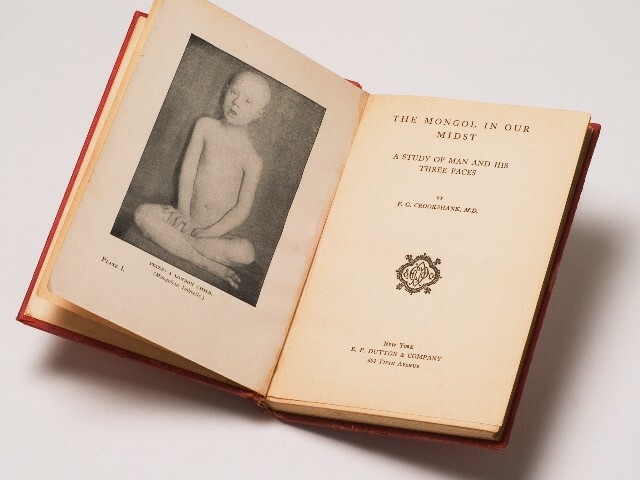 In The Mongol in Our Midst, F.G. Crookshank wrote of "Mongol idiotism" (what we now call Down's syndrome) as a form of racial degeneration. The book cam out months before the 1924 Johnson-Reed Act was passed, restricting the immigration of Southern and Eastern Europeans, and outright prohibiting the immigration of West, South, and East Asians. Fales Library and Special Collections, New York University. 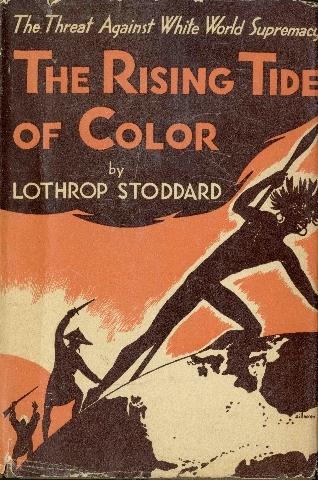 In The Rising Tide of Color, Lothrop Stoddard argued that Japan's victory over Russia in 1904 was a threat to white superiority. The only way to preserve the white race, he wrote, would be to stop immigration from Asia to the Western Hemisphere, Africa, and Australia. Courtesy of the Wong Ching Foo Collection. 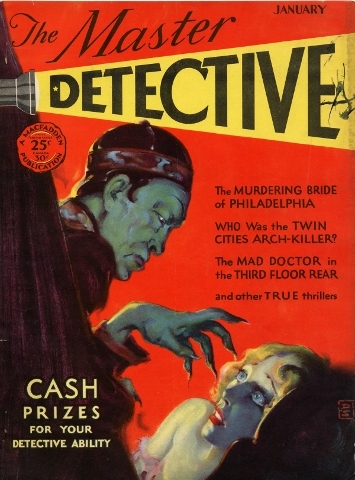 The cover of the January 1930 issue of <em>The Master Detective</em>, by Yoshio Kishi/Irene Yah Ling Sun. It's worth nothing that none of the stories within the issue featured an Asian character, villain or protagonist. Courtesy of Fales Library and Special Collections, New York Univerisity. 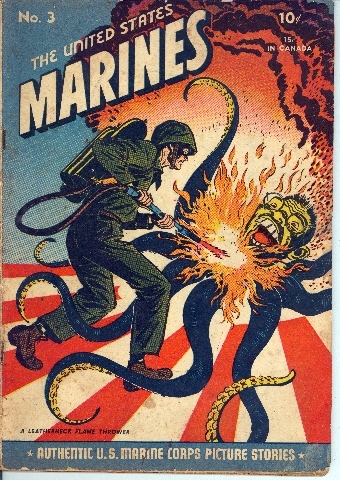 The cover of a U.S. Marine Corps comic book in which a marine scorches a "yellow octopus." Government Comics Collection, Love Library, University of Nebraska, Lincoln. Courtesy of Richard Graham. Throughout U.S. history, politicians and pundits have reshaped the meaning of “America” amid moral panics and national dilemmas. 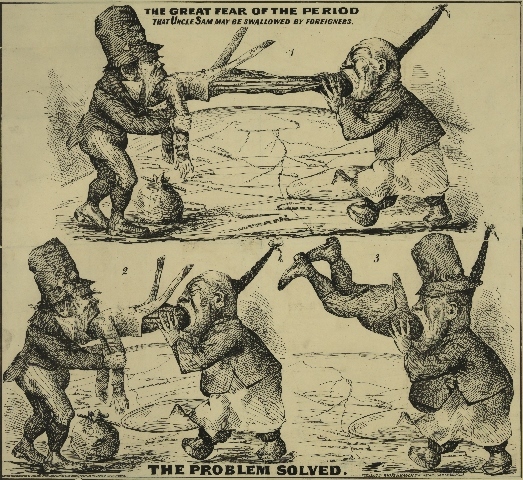 Depicting Chinese immigrants as potential threats to national security in the 1880s secured Congress’s exclusive Constitutional right to regulate immigration as a function of its war powers, internal and external. This became the policy precedent for subsequent immigration exclusion laws and culture wars. Rooting the institutional origins and political logic of the idea of “unassimilable” foreigners (be they racially and/or ideologically unfit for participation in American democracy) in this earlier history helps us carry analysis of the role of yellow perilism forward through the subsequent mid-century variations of the “Red Scare” and more recent calls for excluding “undesirable” and “un-American” groups. Maintaining a narrow notion of proper Americanism, in the face of these supposed threats, has profoundly shaped U.S. political culture. 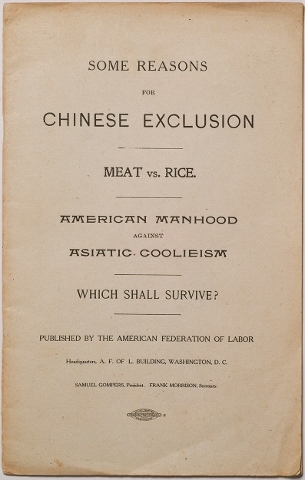 Some reasons for Chinese Exclusion, Meat vs. Rice, American Manhood Against Asiatic Cooliesm, Which Shall Survive? (Washington D.C.: American Foundation of Labor, 1902). Yoshio Kishi / Irene Yah Ling Sun Collection of Asian Americana made possible in large part in memory of Dr. Wei Yu Chen. Fales Library and Special Collections, New York University. This racial civilizational logic led to Chinese Exclusion in 1882 and set the stage for a broader culture of political scapegoating. Eugenicists, for example, claimed inferior races infused with “primitive” African and “semi-civilized” Mongol blood degraded workplaces and neighborhoods, and threatened the stability of the entire social system. Reformers sought to assimilate new European immigrants into “American” standards of living, blaming poor living conditions and crime on Old World cultures, not the poverty of the industrializing machine. Japanese, Korean, Indian, Italian, Russian, and Jewish hordes joined the Chinese as the targets of exclusion in the early twentieth century. When Attorney General Michael Palmer described the “lopsided faces, sloping brows, and misshapen features” of supposedly dangerous radicals in 1919, he linked the American eugenics movement, which dismissed social problems and political opposition as rooted in cultural and biological depravity, to American anti-Communism. This institutional exclusion of dangerous and intermingling Oriental peoples and ideas provided a framework for understanding the challenges ahead. Under the banner of anti-Communism, the federal government waged war against homosexuality, labor-organizing, civil rights, and antiwar activists. Today, U.S. political parties compete over who is tougher on terrorism and China. A tight-knit network of think tanks mobilize disaffected Americans around the newly fabricated “heathen” threat of Sharia Law and Muslim American “radicalization.” FBI informants pressure angry youth on the margins of society to plot “terrorist” acts so they can arrest them. Government operatives infiltrate mosques and antiwar groups to observe and disrupt lawful assemblies. Though ultimately fanciful, these fearmongering techniques have real effects. They silence opposition from the most vulnerable communities, and they focus the anxieties of millions of Americans away from the problems haunting liberalism and onto easy-tohate scapegoats. Arab “control” of oil prices, Japanese “unfair” competition, and the Chinese “manipulation” of currency help politicians and pundits protect Americans from understanding the glaring domestic policy failures underpinning their economic woes. This civilizational-clash framework, built over generations of misinformation, justifies the request for Americans to give up the promise once again. It is no longer the “Asiatic mode of production” or Asian Communism but Asian Capitalism that threatens “the American way of life.” U.S. deficit spending, once necessary to fight Communism, now imperils the nation. 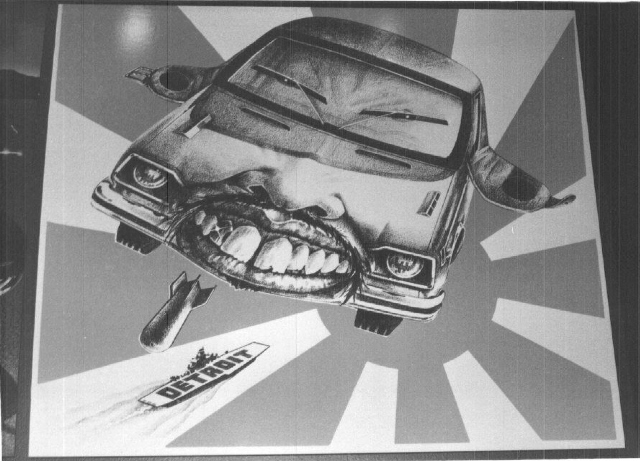 The only constant amid these shifting and contradictory threats to the American Dream, is that Oriental enemies, not U.S. government actions nor corporate practices, are always to blame. Yellow perilist scapegoating obscures the effective analysis of U.S. political debates, but also ostracizes, silences, and sometimes sacrifices individuals and communities on the altar of American fantasy. State repression and vigilante violence has suppressed myriad efforts by communities of color to organize for their survival and success. At the same time, the politics of resentment and suspicion provoke some, desperate to hold on to what they imagine to be theirs, to harass, discriminate, and attack their “un-American” neighbors. This letter, written by a Chinese American shortly after the passage of the 1882 Chinese Exclusion Act, condemns the hypocrisy of an exclusionary theory of liberty. Ironically, Emma Lazarus had famously celebrated the promise of the “huddled masses yearning to breathe free” in America in Joseph Pulitzer’s (also an immigrant) New York World that same year as part of the campaign to finance the construction of the Statue of Liberty pedestal. Saum Song Bo (n.d.) connects his own exclusion from American citizenship with French imperialism in Southeast Asia. A paper was presented to me yesterday for inspection, and I found it to be specially drawn up for subscription among my countrymen toward the Pedestal Fund of the Bartholdi Statue of Liberty. Seeing that the heading is an appeal to American citizens, to their love of country and liberty, I feel that my countrymen and myself are honored in being thus appealed to as citizens in the cause of liberty. But the word liberty makes me think of the fact that this country is the land of liberty for men of all nations except the Chinese. I consider it an insult to us Chinese to call on us to contribute toward building in this land a pedestal for a statue of Liberty. That statue represents Liberty holding a torch which lights the passage of those of all nations who come into this country. But are the Chinese allowed to come? As for the Chinese who are here, are they allowed to enjoy liberty as men of all other nationalities enjoy it? Are they allowed to go about everywhere free from the insults, abuse, assaults, wrongs, and injuries from which men of other nationalities are free? If there be a Chinaman who came to this country when a lad, who has passed through an American institution of learning of the highest grade, who has so fallen in love with American manners and ideas that he desires to make his home in this land, and who, seeing that his countrymen demand one of their own number to be their legal adviser, representative, advocate, and protector, desires to study law, can he be a lawyer? By the law of this nation, he, being a Chinaman, cannot become a citizen, and consequently cannot be a lawyer. Americans have always defended themselves against discriminatory legislation and fought for equal protection under the Constitution. The Chinese Exclusion Act never really worked, for immigrant laborers found ways to circumvent the law that rendered them illegal. As a result, Congress sought to tighten the law such that no Chinese could reenter the U.S. even if they had entered prior to the enactment of Exclusion. Chae Chan Ping (n.d.) traveled to China to attend to his father’s death before the Exclusion Act was tightened and left his family in California. Immigration authorities would not let him return under the newly expanded act. Ping challenged that Congress could not deport a Chinese citizen entitled to reside in the U.S. under the Burlingame Treaty of 1868. The resulting decision, excerpted below, justified legislative oversight over immigration irrespective of treaty obligations as an extension of Congressional war powers. This decision serves as the basis of all immigration law in the U.S. to this day. 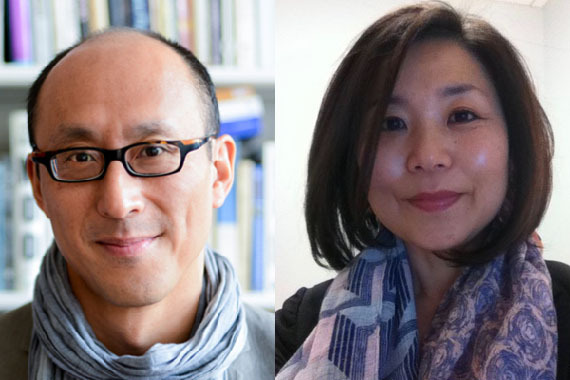 Join the authors along with guest performers and speakers this Friday, March 7, at NYU’s A/P/A Institute to celebrate the publication of Yellow Peril! John Kuo Wei Tchen and Dylan Yeats are the authors and editors of Yellow Peril! 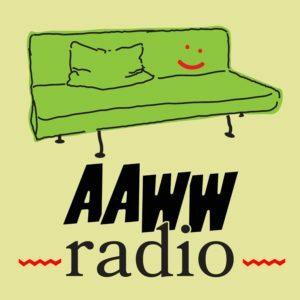 : An Archive of Anti-Asian Fear, published in February 2014. Tchen is a professor at New York University, the author of New York Before Chinatown, and co-founder of the Museum of Chinese in America. Yeats is a doctoral candidate at New York University.